Mortgage loan terminology can get a little confusing, especially when mortgage professionals use the terminology without taking the time to explain the meaning. The trick is to learn some key terms so you can keep up with the conversation and understand any documentation you're given. Here is some common mortgage loan terminology along with a definition in easy to understand terms. Appraisal: This is a review of the home by a certified professional who can estimate the value of the home. ARM: An adjustable rate mortgage, this loan has a varying interest rate that can go up or down. Closing: This is the final procedure where are documents are signed and the ownership of the home switches to the purchaser. Closing Costs: These are the fees, taxes, and other expenses that you must pay upon closing the mortgage loan unless the seller pays them. Down Payment: This is the amount of money you initially pay toward the purchase of the home, ideally 20 percent of the purchase price. Earnest Deposit: This is a relatively small amount of money you offer to the seller when bidding on the home to demonstrate you're serious about purchasing the property. It is applied to the purchase price at closing. Equity: This is the amount of money your home is worth, minus the amount you owe. FHA: The Federal Housing Administration offers a loan guarantee to eligible applicants. Not all lenders deal with FHA loans. Fixed Rate Mortgage: The interest rate does not change for the life of the loan with a fixed rate mortgage. First Mortgage: This refers to the primary mortgage and is not an equity loan or line of credit. Foreclosure: This occurs when homeowners do not pay their loans and the lenders takes possession of the home. Junk Fees: These are closing costs charged by lenders that are solely designed to give the lender a higher profit. Mortgage: This refers to a loan used to purchase a home. The home is collateral for this loan. Refinance: This occurs when one mortgage loan is paid off with another mortgage loan. Reverse Mortgage: This is a loan offered to eligible seniors that allows homeowners to receive cash payments for equity without a monthly payment required. Second Mortgage: This mortgage is an equity loan or line of credit, secured by the equity within the home. Subordinate Mortgage: This is the same as a second mortgage. Survey: This is a mapped out diagram of the property that signifies exactly what portion of the property belongs to the owner. Title Search: This ensures that there are no other owners or no other organization with entitlement to the home. VA Loan: The Department of Veterans Affairs offers mortgage loan guarantees with zero down payment required to eligible personnel. 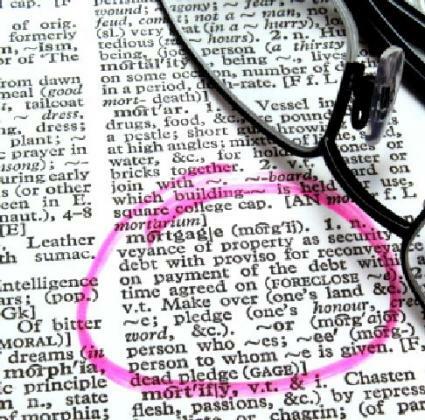 This is merely a brief list of all the potential mortgage loan terminology applicants often encounter when applying for a loan to purchase a home. Armed with this knowledge, however, applicants are in a good position to understand the information presented to them by mortgage loan professionals. Getting a mortgage loan can be a tedious and complicated process, and this process is only made worse by loan professionals who toss mortgage loan terminology around without first making sure that the applicants understand everything being presented to them. Sometimes mortgage professionals are simply so accustomed to the terminology that they forget that the words they use may not necessarily be common knowledge and need to be explained. Applicants have a responsibility to seek out clarification for any verbiage or terminology they don't understand. Whether or not you understand the terminology used on mortgage loan documents, once you sign the paperwork the loan becomes legally binding and you are obligated to pay the mortgage loan as specified within the paperwork. Always ask for clarification about any terms you don't understand. Don't be afraid to stop a loan consultant and request a definition whenever you aren't entirely sure what the consultant is talking about.